For all our frequently asked questions about the Android Time Clock, check out this guide. This article outlines some of the frequently asked questions about the Android Time Clock. What devices will the Android Time Clock work on? The Android Time Clock works on tablets running Android 4.0.3 (Ice Cream Sandwich). Please be aware that the app may not work on lower-end devices, even if running Android 4.0.3. The Android Time Clock will not work on mobile phones or phablets running 4.0.3. The Android Time Clock can be downloaded from the Google Play Store. Click the image below to view the app page. First, only a System Administrator or Location Manager can set up a Android Time Clock for a particular location. After downloading the app, open the app, tap 'Log In' and use your Deputy credentials to log in. Once you have done this, select the organisation and the location you would like to assign the Time Clock to. Once you have done this, employees will be able to start and end their shifts/breaks using the Time Clock and their PIN. What can I do with the Time Clock? You can check shift details, and start/end shifts and breaks on the Time Clock. Does the Android Time Clock support offline mode? The Time Clock does not support offline mode, so a constant internet connection is required to use the Time Clock. Can I use the Android Time in Portrait view? How about Landscape? 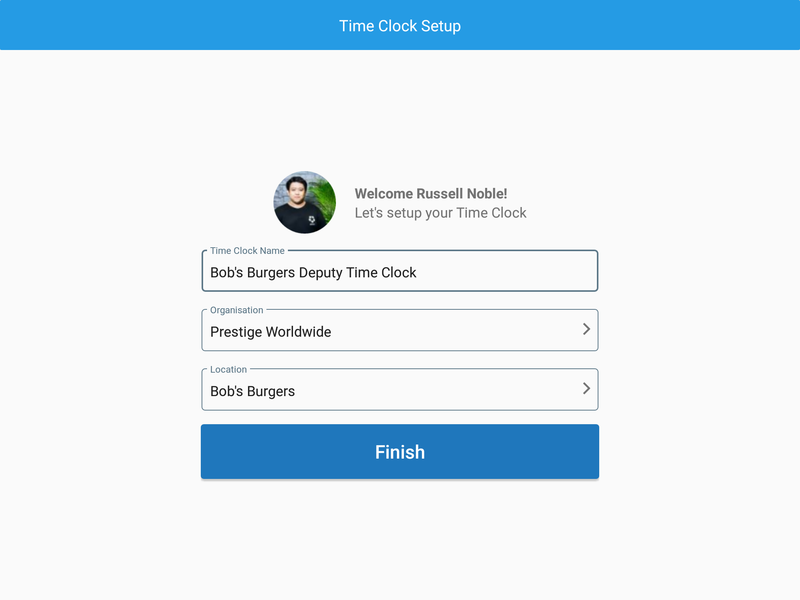 The Deputy Time Clock only works in Landscape view and not Portrait View. The Time Clock does not support split screen, in the case of a business running the Kiosk and a tablet-based POS system at the same time. Can the Android Time Clock use Facial Recognition? Yes, if you have set up the Facial Recognition extension, the Android Time Clock will take a photo and can determine the similarities between the employee's profile photo and the photo taken by the Time Clock. Does the Android Time Clock support Break Planning? Yes, the Android Time Clock uses the rules around Break Planning to ensure employees are taking the correct breaks as scheduled. Please note that if you're business requires custom attestation, you will need to upgrade to an iPad to access Custom Time Sheet Fields through the Kiosk App. For more information about Break Planning, check out this help guide.